The University of New Brunswick Varsity Reds spotted the Dalhousie Tigers the first goal of the game but came back to pick up a 5-2 victory. With the win - their 7th in a row - the V-Reds not only improve their record to 12-3-0, but also maintain sole possession of first place in the conference heading into tomorrow night's match-up with the second place Acadia Axemen. Scoring for the Varsity Reds were Tyler Carroll (assisted by Culligan and Swan on the power play), Bryce Swan (assisted by Braes and Culligan on the power play), Stefan Salituro with his first of the year unassisted, Carroll (Swan) with his second of the game, and Nick MacNeil (in an empty net unassisted). The game was tied 1-1 after one period and UNB led 3-1 after two. - Chad Denny replaced Ben Wright in the line-up. Taylor MacDougall and Luke Lynes remained out. - Denny and Dalhousie's Shea Kewin both received 5 minute fighting majors and game misconducts in the second period. - Dan LaCosta made 11 saves in net to improve his record to 9-0 on the season. By contrast UNB fired 40 shots at the Dalhousie goal. - UNB was 2 for 6 on the power play. Dalhousie was 1 for 4. - In other AUS action tonight St. FX gained a road victory over Moncton 4-3 in overtime, Acadia kept pace with UNB as they defeated UPEI 3-1 at home in a game that featured almost 160 minutes in penalties, and Saint Mary's defeated St. Thomas 3-2 in a shootout in Fredericton. The University of New Brunswick Varsity Reds wrap up the first half of their season this weekend when they travel to Nova Scotia for games against the Dalhousie Tigers on Friday night and Acadia Axemen Saturday night. Both games are scheduled for 7PM. Since the University Cup is scheduled earlier this season the AUS elected to play 16 games before Christmas and 12 after, as opposed to the traditional 14/14 split. As a result this marks the second, and final, regular season visit for UNB this season against each team. The Varsity Reds (11-3-0 conference record, 15-4-0 overall) moved into sole position of first place in the AUS after picking up a pair of victories last weekend - 4-3 at home over the UPEI Panthers on Friday night and 6-2 on the road against the Moncton Aigles Bleus on Saturday. UNB will not only be looking to extend their season-high 6 game winning streak, but also enter the Christmas break on top of the AUS standings for the 6th consecutive year. The V-Reds maintained their 2nd place ranking in the latest CIS top-ten released on Tuesday. UNB has played both Dalhousie and Acadia twice already this season, defeating the Tigers in both meeting and splitting with the Axemen. On October 26th in Wolfville Acadia jumped out to a 3-0 lead after one period of play and never looked back in a 4-2 victory. The next night UNB found themselves trailing late to the Tigers, but 3 straight goals in the final 6 minutes propelled them to a 4-2 win. On November 17th the V-Reds gained some revenge with a 4-2 victory of their own against Acadia at the AUC, while they disposed of Dalhousie with relative ease the next night, winning 6-3. The Varsity Reds depth has started to show during their recent winning streak as they now have 7 players with at least 10 points. This includes Chris Culligan (t-3rd in the league with 16 points, +10), Colby Pridham ( 6g, 9a, +13), Tyler Carroll (8g, 6a, +7), Cam Braes (7g, 5a, +10), Thomas Nesbitt (6g, 6a, +10), Bryce Swan (6g, 5a, +12), and Nick MacNeil (4g, 6a, +4). Marc-Antoine Desnoyers (9a, league-leading +15) continues to enjoy his best season as a V-Red while Daine Todd (3g, 6a, +7), Ben Shutron (1g, 6a, +8), and Ben Wright (1g, 5a, +9) are all among the top-20 in defensemen scoring. Dan LaCosta picked up both wins last weekend as Travis Fullerton was sick. He now a perfect 8-0 on the season with a 2.00 GAA (2nd best) and 0.916 save percentage (4th best). The Tigers dropped both of their games last weekend and now find themselves 3 points out of a playoff spot with a 4-8-2 record thus far. Pierre-Alexandre Vandall (8g, 7a) continues to be far and away their most dangerous offensive weapon with Benjamin Breault (3g, 6a), Francois Gauthier (3g, 6a), Patrick Daley (4g, 4a in 7 games), defenceman Jacob Johnston (1g, 7a), and Brett Theberge (1g, 6a) also chipping in. Wendell Vye (3.45 GAA, 0.883 save percentage) has seen the most action between the pipes for the Tigers as projected number one goalie Bobby Nadeau (3.33, 0.900) has battled injuries. The Axemen picked up 3 out of a possible 4 points last weekend, with a shootout loss to Saint Mary`s being their only blemish. However, that one point is all that separates Acadia from first place UNB as they now sit all alone in 2nd place with a 10-3-1 mark halfway through the schedule. Acadia has a number of highly skilled offensive weapons led by their two award winners from last season. Reigning AUS defenceman of the year Christopher Owens has taken his game to the next level and currently sits 2nd in the league with 19 points (6g, 13a), while Andrew Clark, last season's CIS player of the year, is right behind him tied for 3rd place with 16 points (5g, 11a). They are joined by veteran Dustin Eckelman (6g, 6a) and highly touted rookies Brett Thompson (7g, 5a) and Mike Cazzolla (3g, 9a) in giving the Axemen a dangerous offensive attack. They also feature arguably the best goaltender in the AUS so far this year in Peter DiSalvo, who owns the most victories (9), best GAA (1.86), and second best save percentage (0.921) in the conference. The Dalhousie game will be web-cast here. The Acadia game will be web-cast here as well as broadcast online courtesy AVR (97.7 FM). You can also follow the game via Livestats. Of course you can always follow UNBHockey on Twitter for updates. Other teams receiving votes: Guelph (8), Moncton (7), St. Francis Xavier (7), Lakehead (4), McGill (1), Ottawa (1). Led by a pair of Daine Todd goals and a solid performance from Dan Lacosta in goal, the Varsity Reds continued their winning ways on the road vs Moncton with a convincing 6-2 performance. Also scoring for UNB were Ben Shutron, Tyler Carroll, Bryce Swan and Colby Pridham. Final shots were 38-24 in favour of the V-Reds. The win ensures that UNB will stay at least tied for 1st place in the AUS. It wasn't pretty but the University of New Brunswick Varsity Reds skated away with a 4-3 victory over the visiting UPEI Panthers before 2453 in attendance at the AUC this evening. Bryce Swan was the hero, scoring his second goal of the game with only 55 seconds remaining as UNB rebounded from a blowing a two goal lead for the second consecutive game. With the victory the V-Reds improve to 10-3-0 and remain tied atop the AUS standings with Acadia. The Varsity Reds scored the only goal of the opening frame - on the power play - when Swan, standing at the Panthers blue line, took a stretch pass from Ben Shutron and skated in on a breakaway, snapping a shot past Mavric Parks. Shots on the period were 10-7 for UNB. The V-Reds doubled their lead only 2:14 into the second period as Thomas Nesbitt circled behind the Panthers net with the puck before finding Colby Pridham in tight who fired it top shelf for his 5th goal of the season. However, the lead would quickly disappear as UNB's discipline and penalty killing issues would rear their ugly head again. Ben Wright and Chris Culligan were both sent off less than a minute apart and the Panthers wasted no time tying the game, getting on the board 19 seconds into the 5-on-3 and then beating Dan LaCosta again only 23 seconds later. Both teams had 8 shots in the frame as the game went to the final period tied at two. In the third period the V-Reds regained their lead just over two minutes in when Pridham picked off a break-out pass at the Panthers blue line and passed the puck over to Nesbitt, where his shot was cleaned up in from by Cameron Critchlow. Once again, though, UPEI responded. Mason Wilgosh tied the game for the second time 110 seconds later after some scrambling around by UNB in their own zone. The game would remain tied until the last minute when Tyler Carroll worked hard to gain control of the puck, skated behind the Panthers net, and fired a cross-ice pass against the grain back to Swan, who was camped out near the bottom of the opposite face-off circle. Swan wasted no time firing it into the net before Parks could get in position to give the V-Reds their third lead of the night. This time it would stand as the Panthers had a couple of chances late with the extra attacker, but LaCosta held firm to secure the two points. The Varsity Reds held a 12-11 shot advantage in the period and 30-26 in the game. - Chad Denny, Taylor MacDougall, and Luke Lynes were once again scratched. - UNB was 1 for 6 on the power play. UPEI was 2 for 6. - Swan, Pridham, and Nesbitt were the game's three stars. - Travis Fullerton was out sick so Charles Lavigne was dressed as the back-up. Doing so means Lavigne loses one of his remaining two years of eligibility. - In other AUS action tonight Acadia defeated Dalhousie 4-1 in Wolfville, STU picked up their first win of the year with a 4-1 road decision over Moncton, and Saint Mary's beat St. FX 5-2 on home ice. The University of New Brunswick Varsity Reds are back on the ice this weekend for a pair of games as they try to extend their four game winning streak. On Friday night they host the UPEI Panthers for their final home game of the first half before traveling down the highway for a date with the Universite de Moncton Aigles Bleus on Saturday evening. Both games are scheduled for a 7PM puck drop. The V-Reds (9-3-0 conference record, 13-4-0 overall record) gained a share of first place in the AUS after recording home victories over the Dalhousie Tigers and Acadia Axemen last weekend. They also moved up two positions to 2nd place in the CIS men's hockey rankings that were released on Tuesday. This will be the 2nd regular season meeting of the season between UNB and both UPEI and UdeM. On November 10th the V-Reds skated to a 3-2 victory over the Panthers in Charlottetown while they dropped a 5-2 decision to Moncton on October 13th. The Aigles Bleus also defeated UNB 6-2 in each team's first exhibition game of the season back in September. The Varsity Reds go into the weekend sporting a 4-2 record at home and 5-1 on the road. As the season has progressed they have slowly climbed up the rankings in a number of statistical categories. They now lead the conference in goals per game (4.00), power play percentage (23.0%), shots allowed per game (20.8) and goal differential (+18), and sit second in goal allowed per game (2.50) and 3rd in shots per game (31.7). Meanwhile, they continue to struggle with penalties (worst with 287), penalty killing percentage (6th at 81.0%), and save percentage (last at 88.0%). They also continue to perform much better on the road, despite their success at the AUC last weekend, as they have a much better power play (31.2% on the road vs. 13.8% at home), goals against average (3.17 at home, 1.83 on the road), and save percentage (85.6% at home, 90.7% on the road) away from Fredericton. The V-Reds continue to be led by captain Chris Culligan, the reigning AUS Athlete of the Week, who is tied for second in the conference in scoring with 4 goals and 11 assists, despite missing two games earlier in the season. They have also received big contributions from Colby Pridham (4g, 8a), Cam Braes (6g, 5a), Tyler Carroll (3rd in the AUS with 7g, conference best 4 power play goals), Thomas Nesbitt (6g, 4a), Nick MacNeil (4g, 5a in 11 games), and Bryce Swan (3g, 4a in 10 games). Daine Todd (1g, 6a), Marc-Antoine Desnoyers (5a, league-leading +13), Ben Wright (1g, 4a in 10 games), and Chad Denny (2g, 3a in 9 games) have all shown they can chip in offensively if needed. Dan LaCosta continued his strong season last weekend as he picked up the victory over Acadia and now has a 6-0 record to go along with a sparkling 1.83 GAA and 0.920 save percentage on the year. The Panthers, who won both of the regular season match-ups at the AUC last season, are on a three game losing streak but are still holding on to the 6th, and final, playoff spot with a 5-6-1 record, only a single point ahead of Dalhousie. With the off-season departure of top scorers Matthew Carter and Jared Gomes it shouldn't be surprising to see UPEI ranked 7th in the league in scoring (2.67), 5th in shots per game (28.2), and 6th in power play percentage (17.7). They have particularly struggled on the road, averaging only 2.40 goals per game and a paltry 4.2% success rate with the man advantage (1 for 24). However, a strong penalty kill (3rd at 82.1%) and one of the best goaltending tandems in the league (3rd with a 0.906 save percentage) has kept the Panthers in most games. Despite their offensive struggles thus far UPEI features a fairly balanced attack, with 11 players recording at least 5 points so far. This includes veterans Jordan Knox (3g, 7a) and Mike MacIsaac (5g, 4a), along with rookies Mason Wilgosh (4g, 5a) and Tyler Brown (4g, 5a). Chris DeSeousa (4g, 4a in 9 games) has returned from an AHL try-out and has picked up right where he left off after an impressive rookie campaign. The Panthers also have two of the most dangerous defencemen in the conference in Reggie Traccitto (4g, 4a in 11 games) and Matthew Maione (2g, 5a). Wayne Savage and Mavric Parks have split duties in net thus far, although Savage, who has returned to the team after two years away, has been much better so far with a 4-2 record, 2.45 GAA, and a league-leading 0.928 save percentage. The Aigle Bleus enter the weekend with a 7-3-2 record, good enough for sole position of third place. They sit two points behind the first place Varsity Reds and Acadia Axemen, but only one point up on both Saint Mary's and St. FX. They have stumbled a bit of late though, with only two wins in their last five games. Moncton, ranked 7th in the country, are 3rd in the conference in goals per game (3.58), 4th in power play percentage (20.7%), 3rd in goals against average (2.83), and 1st in save percentage (0.915). They are particularly dangerous when they are down a man as they not only rank 1st in penalty killing (86.8%), but also 1st in shorthanded goals for (4). They are also much more dangerous offensively at home as they have averaged 4.40 goals per game and operate at 30.4% on the power play at home compared to 3.00 and 14.3%, respectively, on the road. The Aigles are also capable of getting offensive contributions from a number of players, as evidenced by the 9 players who have already registered 7 points. Eric Faille (6g, 8a) remains one of the most dangerous players in the AUS and is joined by Guillaume Parenteau (5g, 7a), Francis Rochon (5g, 5a), rookie Alex Emond (6g, 1a), and Christian Gaudet (2g, 5a). Moncton is also one of the top teams in terms of getting production from their back-end, with Remi Blanchard (2g, 5a), Mathieu Bolduc (2g, 5a), Samuel Groulx (1g, 6a), and Simon Lacroix (7a) all among the top scoring d-man in the conference. It appears that rookie goaltender Andre Lemay has secured the number one starter role for the time being as he has outplayed veteran Andre-Michel Guay in every aspect, posting a better record (5-2-2 vs. 2-1-0), goals against average (2.51 vs. 3.98), and save percentage (0.927 vs. 0.867). He was also in net for Moncton's victory over UNB on opening weekend, making 24 saves on 26 shots. If you can't make it to either game this weekend they will be web-cast here (vs. Panthers) and here (vs. Moncton). You can also follow UNBHockey on Twitter for updates. University of New Brunswick Varsity Reds forward, and team captain, Chris Culligan has been named the Subway AUS Male Athlete of the Week, the league announced yesterday. The 4th year veteran had a big weekend as the V-Reds won both of their games to move into a first place tie with Acadia. On Friday night Culligan notched 3 assists and was named the player of the game in UNB's 6-3 victory over Dalhousie. The following evening, in a game against the first place Axemen, he scored a shorthanded goal late in the first period to give UNB a 1-0 lead and then assisted on Tyler Carroll's game winning goal in the third period. The Varsity Reds would go on to a 4-2 win. After his big weekend the Howie Center, Nova Scotia native now sits in a tie for second in the conference in scoring with 4 goals and 11 assists in only 10 games. You can read the AUS press release here. X - Toronto (over Lakehead) was awarded the higher ranking based on number of higher placed votes. Other teams receiving votes: Lakehead (14), Saint Mary’s (13), Guelph (10), St. Francis Xavier (6), Carleton (4), Calgary (3), Regina (1). The University of New Brunswick Varsity Reds are back at home this weekend as they host the Dalhousie Tigers on Friday night and Acadia Axemen Saturday night. Puck drop for both games is scheduled for 7PM. It should also be noted that Friday night's game will be the annual North Side Elementary School Night so we recommend arriving a little early to ensure your seat. This will be UNB's 2nd meeting of the season with both of these teams. On October 26th the V-Reds lost their first, and so far only, road game of the season with a 4-2 setback at the hand of the Axemen. They rebounded the next night with a late rally to defeat Dalhousie 4-2. The V-Reds (7-3-0 conference record, 11-4-0 overall) are coming off of a weekend in which they picked up a pair of victories. On Friday night they made their debut at the new Grant*Harvey Centre and skated away with a dominating 6-1 victory over St. Thomas. The following evening they traveled to Charlottetown for a date with the UPEI Panthers and emerged with a 3-2 win. UNB, currently ranked 4th in the men's hockey rankings, now sits in 2nd place in the AUS with 14 points, one point ahead of Moncton and two up on Saint Mary's. The Varsity Reds have surprisingly struggled at the AUC thus far this year, only going 2-2 in their first 4 games. By comparison, the V-Reds had compiled a 26-2 record at home over the last two years - and 63-6-1 over the previous five seasons. This may be attributed to a defense that has allowed 3.50 goals per game at home (compared to 1.83 on the road) and goaltending that has a save percentage of only 0.843 at home (compared to 0.907 on the road). The power play (11.1 at home, 31.2% on road) and penalty killing (77.4% at home, 81.6% on road) have also been better away from the Aitken Centre. The V-Reds have been led offensively by Colby Pridham (4 goals, 11 assists), Chris Culligan (2g, 8a), Cam Braes (4g, 5a), Thomas Nesbitt (5g, 4a), and Tyler Carroll (4g, 3a). Chad Denny (2g, 3a), Daine Todd (5a), Marc-Antoine Desnoyers (4a, team leading +10), and Ben Wright (1g, 3a) have provided solid production from the blue-line, while Dan LaCosta (5-0, 1.80 GAA, 0.924 save percentage) and Travis Fullerton (2-3, 3.24 GAA, 0.820 save percentage) continue to split the playing time almost 50/50 in net. Dalhousie features an offense that includes Pierre-Alexandre Vandall (8g, 7a), Patrick Daley (4g, 4a), Benjamin Breault (1g, 6a), and Brett Theberge (1g, 6a), while Jacob Johnston (1g, 6a) has provided offense from the back-end. The Tigers have used three goalies already this season, with Wendall Vye (3.51 GAA, 0.869 save percentage) getting the majority of the playing time between the pipes even though Bobby Nadeau has posted better numbers (3.33 GAA, 0.900 save percentage). The Axemen (8-2-0) have undoubtedly been the best team in the conference so far as they sit on top of the standings, two points ahead of the V-Reds. Their recent run of 8 wins in 9 games has moved Acadia up to #2 in the latest top ten rankings. Of course, given their record, Acadia is near the top of the league in a number of statistical categories, including goals per game (3rd at 3.70), shots per game (1st at 36.8), penalty minutes (1st at 159), penalty killing percentage (1st at 89.5%), and goal against average (1st at 2.15). One area in which they have struggled has been on the man advantage as their 14.0% success rate is good enough for only 7th. Once again Acadia has relied heavily on defenceman Christopher Owens (4g, 10a) and forward Andrew Clark (5g, 7a), arguably the two best players in the AUS. They have been complemented by highly touted rookies Mike Cazzola (3g, 6a) and Brett Thompson (5g, 3a), as well as veterans Dustin Ekelman (5g, 4a), Cullen Morin (1g, 7a), and Jonathan Laberge (3g, 4a). Pete DiSalvo has received the bulk of the playing time in net and has responded with a 1.62 GAA and 0.920 save percentage in almost 520 minutes of work. Both games will be web-cast as well as broadcast on CHSR-FM (97.9 on your radio dial or online here). You can also follow UNBHockey on Twitter for updates. UPDATE: The Guardian has their game recap posted. The University of New Brunswick Varsity Reds picked up their 2nd win of the weekend, and 4th in 5 games, with a 3-2 victory over the UPEI Panthers tonight in Charlottetown. The victory moves UNB to 7-3-0 on the season and into sole possession of 2nd place in the AUS, two points behind Acadia. After a scoreless first period the V-Reds took a 2-0 lead with a pair of goals in the first 1:02 of the second period. Thomas Nesbitt (Desnoyers, Todd) gave the V-Reds a 1-0 lead 40 second into the frame and Colby Pridham (Culligan, Wright) doubled the lead only 22 second later. However, the Panthers answered back with a power play goal at 4:41 and an even strength marker at 8:54 to send the game to the third period all square at 2. The Varsity Reds came out strong in the final period and controlled the majority of play, but they would find themselves in a familiar situation - being forced to kill off a 5-on-3. UNB was up to the challenge and only 31 seconds later they would take a 3-2 lead when Antoine Houde-Caron (unassisted) made a nifty play in close to get the puck up over Panthers goalie Mavric Parks. The Panthers pulled their goalie in the last minute and survived a couple of UNB shots towards the empty net before forcing Dan LaCosta to make a great save from in close in the dying seconds, preserving the victory for the V-Reds. - Adrian Robertson was back in the line-up for UNB, replacing Chad Denny. Stefan Salituro and Luke Lynes remained out. - Taylor MacDougall left the game early in the first period due to an apparent injury. - Final shots were 30-25 for UNB. - UNB was 0 for 3 on the power play. UPEI was 1 for 4. - Other AUS action tonight seen Moncton defeat St. Thomas 3-2 in Fredericton and Acadia picking up a 2-1 road victory over St. FX. - The V-Reds are back at the AUC next weekend for games against Dalhousie on Friday night and Acadia the following evening. The University of New Brunswick made themselves right at home in their debut at the Grant*Harvey Centre, defeating the St. Thomas Tommies 6-1 tonight before an announced attendance of 1772. This also marked the 200th all-time meeting between the two rivals, with UNB currently holding a 138-54-8 record in those game. Thomas Nesbitt got UNB on the board 6:28 into the game when his quick snap shot from the face-off circle to the right of Tommies goalie Jonathan Groenheyde made its way into the net. The goal, which came on the power play and was assisted by Daine Todd and Colby Pridham, was the lone goal of the period despite UNB holding a 10-1 advantage in shots. The Varsity Reds would break the game open in the middle stanza, scoring 3 goals and out-shooting the Tommies 18-0. Tyler Carroll (Swan, Shutron) sniped a power play goal at 10:48, Nick MacNeil (Braes) made it 3-0 at 13:28 after some fortunate bounces kept the puck in STU's zone, and Bryce Swan (Critchlow, Todd) rounded out the scoring in the period when he got a short break away and beat Groenheyde with a shot along the ice. Shots after two period were 28-1 for UNB. The V-Reds power play continued to click in the 3rd period as both of their goals came with the man advantage. Geordie Wudrick (Culligan, Braes) picked up a rebound and fired it into a wide open net at 11:13, only for Chris Morehouse to answer just 8 seconds later for the Tommies when his shot beat Travis Fullerton. Chris Culligan (Desnoyers) would put the finishing touches on a dominating display by the V-Reds with a goal at 14:07. Shots favoured UNB 17-6 in the period and 45-7 in the game. - Adrian Robertson took the pre-game warm-up but did not play. Josh Kidd replaced him in the line-up. Stefan Salituro and Luke Lynes were also scratched. - Players of the game were Swan, Culligan, and Groenheyde. - UNB ended up 4 for 7 on the power play. STU was scoreless on 3 opportunities. - Face-offs favoured UNB 49-22. - Tommies goalie Jonathan Groenheyde made 30 saves on 34 shots before leaving in the 3rd period with an apparent injury. Backup Justin Collier turned aside 9 out of 11 shots in relief. - Tyler Carroll took a Chad Denny shot off his ankle in the first period and was in visible discomfort coming off the ice. Daine Todd was also shaken up in the early going after taking a puck to the head/helmet. Fortunately, neither player missed much time. - Thomas Nesbitt played arguably his strongest game in a V-Reds uniform as he scored a goal, had 4 shots on goal, and created numerous turnovers and scoring chances because of his strong fore-checking. - Matt Filler, Ben Wright, and Pridham were the alternate captains for the game. - In other AUS action tonight St. FX earned a 5-4 overtime victory over Dalhousie in Antigonish, Acadia defeated Saint Mary's 3-2 in Halifax, and UPEI picked up a big 6-3 road win against Moncton. - The Varsity Reds travel to Charlottetown to face UPEI tomorrow night. Other games include Moncton at St. Thomas and Acadia at St. FX. A new chapter in the Battle of the Hill will be written tomorrow night when the University of New Brunswick Varsity Reds travel up the hill for the first time to make their first appearance at the new Grant*Harvey Centre against the St. Thomas Tommies. Game time is scheduled for 7PM. The V-Reds (5-3-0 conference record, 9-4-0 overall) are coming off of a weekend in which they split a pair of games at home. On Friday night they defeated St. FX 5-3, before falling to Saint Mary's by a 4-3 margin the next evening. These results dropped UNB to 6th spot in the latest men's hockey top ten, their lowest ranking since October of 2006. They currently sit 4th in the AUS with 10 points, two behind Acadia and Saint Mary's and one back of Moncton. UNB has been much better on the road in the early going, compiling a 3-1 record and outscoring their opposition 14-8. They have also been better with the man advantage away from the AUC, operating at a 27.3% mark. However, the disparity in penalties continues to be an issue for the V-Reds. They have received the 2nd fewest power play opportunities (40, 8 more than STU) in the conference, but have been shorthanded far and away the most (61 times). SMU and Dalhousie have been shorthanded 60 and 51 times, respectively, but in one more game. UPEI and Moncton, at 44 each, are the next closest. The V-Reds 13 power play goals allowed is also a league-worst. The Varsity Reds have been led offensively by Colby Pridham (3 goals, 6 assists), Chris Culligan (1g, 6 a), Cam Braes (4g, 3a), Thomas Nesbitt (3g, 4a), and Tyler carroll (3g, 3a). Dan LaCosta continues his strong play in net with a 4-0 record, 1.75 GAA, and 0.925 save percentage so far. The Tommies (0-8-0, 0-9-0) struggles continued last weekend as they dropped a pair of games in Nova Scotia - 3-2 against Acadia on Friday and 2-0 to Dalhousie on Saturday. They now find themselves 7 points out of 7th place and 9 points out of a playoff spot. As one would expect, given their record, St. Thomas finds itself near the bottom of the conference in a number of categories. They rank last in the AUS in goals per game (1.11), shots per game (22.0), power play goals (3), power play opportunities (34), power play percentage (9.4%), shows allowed per game (37.8), and goals allowed per game (3.88). They also rank 7th in the league in penalty killing at 78.6%. One bright spot so far has been the play of goaltenders Jon Groenheyde and Justin Collier who, despite facing a ton of shots, rank 4th in the league with a .898 save percentage. Meanwhile, Stephen Sanza (2g, 2a), Jonathan Bonneau (1g, 2a), Marc-Andre Levesque (3a), captain Felix Poulin (1g, 2a), and Mike Reich (2g, 1a) have provided the bulk of the Tommies offense. If you cannot make it to the game it will be web-cast here as well as broadcasted by CHSR-FM (either by tuning your radio dial to 97.9 or listening online). You can also follow UNBHockey on Twitter for updates. OTTAWA (CIS) – The University of Saskatchewan Huskies top the CIS men’s hockey national rankings for the second straight week. The Huskies (7-1-0) once again received 15 first-place votes from the 17-member media panel to remain ahead of their Canada West archrivals, the Alberta Golden Bears (7-3-0), who finished second in the voting for the second week in a row. Alberta and the UQTR Patriotes (6-2-1) both earned a first-place nod in the fifth poll of the campaign. There is a lot of movement behind the two leaders in the new Top 10. The Acadia Axemen (6-2-0) move up three spots to No. 3; UQTR is up one to No. 4; Moncton (5-2-1) is down a pair to No. 5; UNB (5-3-0) is also down two positions to a season-low No. 6; Lakehead (6-3-1) is up one to No. 7; Saint Mary’s (5-3-0) is ranked nationally for the first time this season, at No. 8; Calgary (5-3-0) is up one spot to No. 9; and Windsor (6-2-0) makes its way to the Top 10 for the first time in 13 years, at No. 10. The Lancers swept a two-game series against Toronto – ranked ninth last week – over the weekend, 5-3 and 3-1, to earn their first CIS ranking since the March 15, 1999 poll (No. 6). No. 1 Saskatchewan enjoyed a break in its Canada West schedule last week and gets back on the ice this weekend for a home-and-away doubleheader against provincial rival Regina (5-3-0). Calgary with the series opener set for Friday night in Edmonton. No. 3 Acadia edged St. Thomas 3-2 last Friday before dominating a Top-10 battle against Moncton on Saturday by a 4-0 score. The Axemen face another stiff test Friday night when they visit No. 8 Saint Mary’s in Halifax. Other games to keep an eye on this weekend include a two-match set between OUA East-leading UQTR and OUA West-leading Lakehead in Thunder Bay, Ont. Also receiving votes: StFX (17), Toronto (16), McGill (6), Ottawa (5), Western (4), Carleton (3), Manitoba (2), UPEI (1). The University of New Brunswick Varsity Reds fell to 5-3-0 on the season after suffering a tough 4-3 loss to the Saint Mary's Huskies tonight at the AUC. 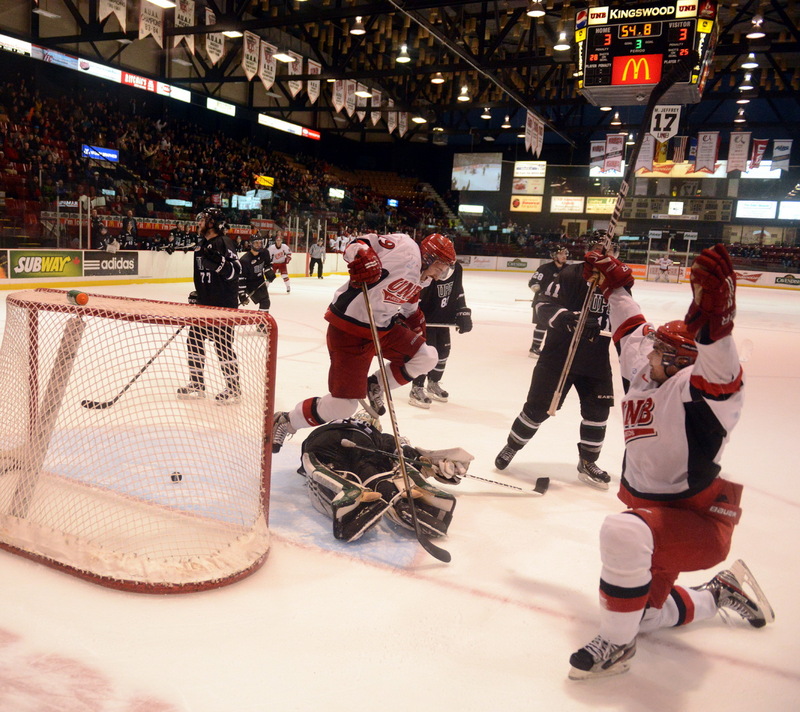 The game that featured 13 power plays for the Huskies to only 3 for UNB. The Varsity Reds led 2-1 after the first period but a number of penalties eventually caught up to UNB as the Huskies tied the game on the power play in the second period, and went up 4-2 with a pair of 5-on-3 goals only 52 seconds apart in the third. Colby Pridham scored his 3rd goal of the season against his former team to cut the deficit to one with just 5 minutes remaining but UNB was unable to find the equalizer. We know people will be talking about the refereeing in this game and, while some of the calls were questionable, most of them were deserved. The fact is UNB gave St. FX 6 straight power plays in their game two week ago, another 5 straight to the X-Men last night, and 8 straight (and 10 out of the last 11) to Saint Mary's tonight and you can't continue to do that and expect to be successful. The V-Reds lack of discipline thus far continues to be a concer and is something that needs to be rectified sooner than later. - UNB only dressed 5 defencemen for the game. Adrian Robertson and Josh Kidd were out while Nick MacNeil was back in the line-up after serving a one game suspension for a 5 minute major penalty he picked up last weekend. - Along with Pridham, Cameron Critchlow and Thomas Nesbitt also scored for UNB. Bryce Swan, Cam Braes, Chris Culligan, and Marc-Antoine Desnoyers all picked up assists on the night. - After giving up the first 7 shots of the game UNB held a 37-13 advantage the rest of the way for a game total of 37-20. - UNB was 0 for 3 with 4 shots in 4:29 of power play time. Saint Mary's was 3 for 13 with 8 shots in 15:33 on the man advantage. The V-Reds managed to kill off their first 8 shorthanded situations before giving up 3 goals on their last 5. - The V-Reds went 39 and 28 in the face-off circle. Pridham won 12 out of his 18 draws. - Travis Fullerton took the loss in net and Anthony Peters picked up the victory. - The Huskies were the only road team to win in the AUS tonight. Other winners included Dalhousie (2-0 over St. Thomas), Acadia (4-0 over Moncton), and UPEI (3-2 over St. FX in overtime). UPDATE: David Kilfoil, via UNB Athletics, and hockeyscene.com both have their game recaps posted. The University of New Brunswick Varsity Reds hung on for a crucial 5-3 victory over the visiting St. FX X-Men tonight at the AUC. With the win the V-Reds remained tied with Acadia for second place in the AUS, a point behind Moncton. The Varsity Reds built a 4-1 lead through two periods before seeing their lead cut to one after St.FX scored two quick goals midway through the final frame. An empty netter salted away UNB's 5th win of the season. - Geordie Wudrick (Wright, MacDougall), Chris Culligan (Carroll, Pridham), and Adrian Roberston (Salituro, Swan) staked UNB to a 3-0 lead only 7:11 into the opening period, outshooting the X-Men 10-0 in the process. Steven Kuhn got St. FX on the board at 11:45. Shots in the first period were 17-5 for UNB. - The Varsity Reds restored their 3 goal lead at 16:14 of the second period thanks to a "Chad Denny Special". Denny received the puck at the point after a face-off win and wired a slap shot that goalie Drew Owsley did not appear to see. Wudrick and Cameron Critchlow picked up assists on the goal. This came shortly after Denny had taken a penalty that put UNB two men down for 1:02. Shots in the period were 11-10 for St. FX. - The Varsity Reds controlled most of the play in the third period but Jarrad Struthers converted on a power play at 11:01 to cut the lead in half and then, only 32 seconds later, Brad Cuzner wristed a shot from the blue line that got through both a screen in front as well as goalie Dan LaCosta to suddenly make it a 4-3 game. Matt Fillier (Culligan, Pridham) put the game away with an empty net goal with 12 seconds left. UNB outshot St. FX 13-11 in the period and 40-27 in the game. - Culligan and Swan were both back in the line-up after each were on the receiving end of some hard hits last weekend. Culligan did spend a majority of the game playing right wing, as opposed to his usual centre position. Josh Kidd and Nick MacNeil were both out of the line-up. - The V-Reds were 0 for 3 with the man advantage. St. FX managed a goal on 6 opportunities. - UNB won 40 out of the 72 face-offs in the game. Cam Braes went 11 and 4, while Pridham was 11 and 9 in the dot. - The final seconds of the game were delayed for a short while after a fan jumped onto the ice near the St. FX net. He was quickly taken down by one of the refs and escorted off the ice. - In other AUS action tonight Saint Mary's went on the road to defeat UPEI 7-5, Acadia picked up a home win over St. Thomas 3-2, and Moncton doubled up Dalhousie 4-2 in Halifax. - UNB hosts Saint Mary's tomorrow night at the AUC. Game time is 7PM and it will be web-cast online as well as broadcast on CHSR-FM (either 97.9 on your radio dial or online). After playing four consecutive games in Nova Scotia the University of New Brunswick Varsity Reds return to the friendly confines of the Aitken Centre for a pair of games this weekend, beginning tomorrow night against a visiting St. FX X-Men team that is currently tied with both UNB and Acadia for 2nd place in the AUS. Game time is scheduled for 7PM. The V-Reds (4-2-0 conference record, 8-3-0 CIS record) find themselves in an unfamiliar position as their 4th place showing in the latest CIS Top Ten marks the lowest UNB has been ranked since January 2009. The X-Men (4-2-0, 8-2-1), meanwhile, dropped two spots from 5th to 7th. KEY STATS: The Varsity Reds continue to hover near the top of the league in both goals scored per game (3rd at 3.50) and fewest goals allowed per game (t-1st at 2.50). However, they are still having trouble getting the puck on net as evidenced by their 5th place ranking in shots on goal (26.50), a figure that is almost 10 shots per game lower than what we have been accustomed to seeing the last 4 or 5 years. After failing to produce at least 30 shots in a game only 6 times last season, the V-Reds already have 5 such games this year. A shooting percentage of 13.2% (2nd) has off-set the lack of shots thus far. The V-Reds have still been doing an exceptional job of limiting their opponent's chances, though, as they have allowed a league-low 21.33 shots per game. Another bright spot has been a much improved power play, which sits 2nd in the conference with at 23.5% success rate. This is boosted by a 3 goal performance against the X-Men in their first meeting two weeks ago. However, the combination of taking lots of penalties (3rd most with 52 - 12 more than their opponents) and a poor penalty killing percentage (6th at 78.6%) means the V-Reds have given up a league-high 9 power play goals. Despite finding themselves in a tie for 2nd place with a 4-2-0 record the X-Men sit in lower half of the league in a number of categories through 6 games, including goals per game (t-4th at 3.33), goals allowed per game (6th at 3.17), shots per game (t-6th at 25.83), power play goals (t-6th with 5), shots allowed per game (6th at 31.3), power play percentage (6th at 16.1%), and penalty killing percentage (7th at 75.0%). They have survived mainly due to three things - being disciplined (league-low 12.67 penalty minutes per game), being opportunistic (t-3rd with a shooting percentage of 12.9%), and good goaltending (3rd with 0.899 save percentage). HEAD TO HEAD: This is the second meeting of the season between the two teams, and the first at the AUC. The V-Reds prevailed 4-2 on October 20th in Antigonish behind a 3 point (1 goal, 2 assists) performance by Chad Denny. The win improved UNB's record to 11-1-1 over the last 4 seasons against St. FX in conference play. They are also 7-0-1 in their last 8 visits to the Keating Millenium Centre. Of course, as we all know, the playoffs have been an entirely different story. The two teams will meet twice more in the regular season - January 11th in Antigonish and January 26th in Fredericton. RECENT GAMES: The V-Reds are coming off of a 1-1 road trip to Acadia and Dalhousie last weekend. On Friday night the Axemen scored 3 power play goals in the first period and UNB was never able to recover, dropping a 4-2 decision. The following night the V-Reds found themselves trailing 2-1 late in the 3rd period to the Tigers before scoring 3 unanswered goals to pull out a 4-2 win. Cam Braes led the attack with 2 goals and an assist. The X-Men also split their two games last weekend. They were in Fredericton on Friday to face St. Thomas and got a goal with under 3 minutes remaining to escape with a 3-2 victory. On Saturday they traveled down the Trans-Canada to Moncton where they fell by a 4-2 count to the Aigles Bleus in a game they never led. WHO TO WATCH FOR ON ST. FX: Through 6 games the X-Men have been led offensively by 2010-2011 CIS Rookie of the Year Jason Bast (2 goals, 6 assists), who also leads the team by a wide margin with 25 shots on goal - 10 more than the next closest player, Brennan Wray (1g, 5a), rookie Cory MacIntosh (3 goals on 4 shots, 4 points in 5 games), and 2011-2012 AUS Rookie of the Year and former Saint John Sea Dog Michael Kirkpatrick (2g, 2a). Defencemen Spencer MacAvoy (2g, 2a), R.D. Chisholm (1g, 3a), Josh Day (1g, 2a), and highly touted rookie Bronson Maschmeyer (1g, 1a) form one of the most dangerous bluelines in the conference. Joey Perricone has been the majority of time between the pipes (240 minutes, 3.00 GAA, 0.893 save percentage) but rookie Drew Owsley has arguably outperformed the veteran thus far proven to be a very capable back-up so far with a 2-0 record, 3.00 GAA, and 0.919 save percentage in 120 minutes. WHO TO WATCH FOR ON UNB: The V-Reds feature a balance scoring attack with 12 different players finding the back of the net already. Cam Braes (4g, 2a), Thomas Nesbitt (2g, 4a, team-high 18 shots), and Colby Pridham (2g, 4a, +5) have led the way thus far, but have received plenty of support from Tyler Carroll (3g, 2a), Nick MacNeil (3g, 2a), Chad Denny (1g, 3a), and Chris Culligan (4a in 4 games). Matt Fillier (1g, 2a) and Antoine Houde-Caron (1g, 1a) have provided a spark on the 4th line while defencemen Ben Shutron (1g, 1a) and Marc-Antoine Desnoyers (1a) have helped out in other ways besides scoring, as evidenced by their +4 and +5 ratings, respectively. Goaltender Dan LaCosta (1.33 GAA, 0.939 save percentage) continues to make his case for more playing time going forward, while Travis Fullerton (3.72 GAA, 0.823 save percentage) continues to endure his worst stretch since coming to UNB, to the shock of many. FOLLOW ALONG: If you can't make it out to the game it will be shown live on Rogers TV in New Brunswick (channel 10 on cable), web-cast here, and broadcast on CHSR-FM either by tuning to 97.9 on your radio dial or listening online. You can also follow UNBHockey on Twitter or updates.